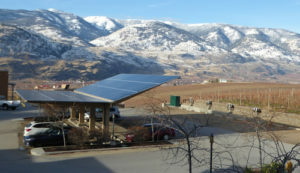 The south Okanagan valley is one of Canada’s best locations for capturing perpetual, green energy from the sun and converting into either heat or electricity. In 2016 Burrowing Owl Estate winery is moving forward with a major commitment to photovoltaic (PV or electrical) solar panels, that will produce clean/green electricity efficiently for the next 25 years. Ten years ago, the winery made its first foray into renewable solar energy panels to produce hot water, a commodity that wineries use in large quantities for barrel washing and other cellar-related cleansing functions. During the hottest summer months, our hot-water solar panels actually produce more hot water than we can use or store, so any excess heat is “dumped” into our swimming pool to the delight of our Guest House patrons. Burrowing Owl Estate Winery recently installed three sizable solar electric systems in conjunction with the construction that occurred during 2016 & 2017 which increased the size of our wine making cellar by 7,500 sq ft. This expansion at the northern end of the winery has 3,350 sf of open roof-top space. This area is now blanketed by 70 solar panels, each producing 310-volts of electricity. In total these 70 panels are expected to produce 25,770 kWh/year, while offsetting approximately 13,825 Kg (15.2 tons) of CO2 emissions annually. In the centre of our winery parking area is a landscaped “island” with parking for 12 cars. During the fall of 2017, we constructed a unique structure made out of 108 solar panels that covers that area. This structure provides shade for our visitors from the blazing summer sun, and is also rain-proof. These panels in the parking lot generate 53,000 kWh/year and offset CO2 emissions of 12,250 Kg (27 tons) every year. The winery’s main warehouse is located in Oliver, and during 2017 it was enlarged to securely enclose a total of 45,000 sf of heated/air-conditioned space. Due to rigorous wall and ceiling insulation treatments, the average annual electrical power usage is approximately 63,000 kWh/per year. Part of the new building’s design concept was to take advantage of an enormous south-facing roof area and install 160 solar panels in that location. These panels provide 63,000 kWh/year and reduce carbon emissions by 13,600 Kg (30 tons) annually. And further, since the energy produced during the course of a year will match the energy used, this facility will have a “zero carbon footprint”, probably the first such claim to be made in our region by anybody! As a demonstration of our support for electrically powered automobiles, during 2017, Burrowing Owl Estate Winery installed eight new EV (electrical vehicle) charging stations: four (4) of these are for Tesla vehicles, while the remaining four (4) use the universal (Sun Country) nozzle. All eight (8) charging stations are for the use of our visitors and staff. At present there is no charge for this service. 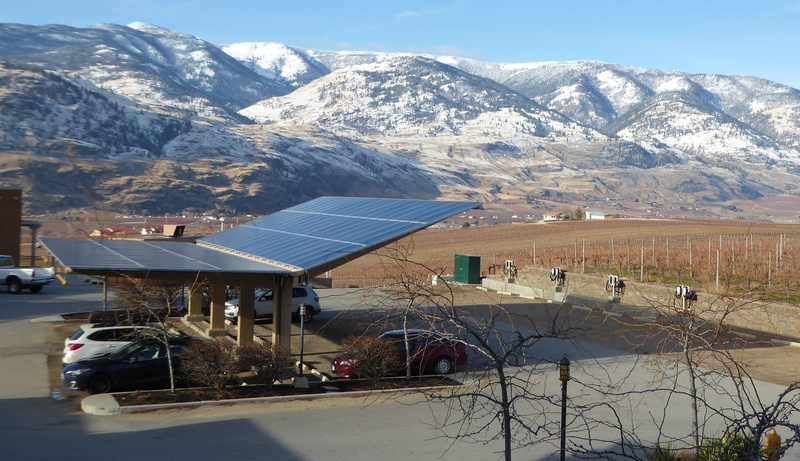 In 2006, Burrowing Owl Estate Winery took its first step into renewable energy with an investment into solar hot water panels. Our second step occurred during the winery expansion of 2016 and 2017, when we installed 178 solar electric panels that will produce 78,200 kWh/year off-setting 18,100 Kg (40 tons) of CO2 every year, forever. The total contribution of solar energy at Burrowing Owl from all sources, is now the equivalent of 263,327 kWh/year, which will offset carbon emissions by 134.3 tons/year. This is enough to power 22 average Canadian homes for a full year! These are large numbers, of which we are very proud. Stay tuned . . . this will not be our last step into the field of alternative, renewable energy.